-70% of the world´s poor are women. -Two out of three illiterate adults are women. -More than 2/3 of the unpaid work in the world is done by women. -7 out of 10 hungry people in the world are women and children. -Throughout the world 20-50% of women experience some type of domestic violence during the course of their marriage. -The majority of victims of war today are women and children, not soldiers. -The majority of women earn, as a rule, about 3/4 of the salary of men for doing the same job, (not counting the agriculture industry) whether in industrialized countries or developing countries. -Human trafficking is the fastest-growing international crime and one of the most important sources of income for organized crime. Between 600,000 and 800,000 men, women and children are trafficked and 80% of them are women and children. Even now in the 21st century there is trafficking of women through deception or the use of force. They are forced to leave their homes to be exploited in different ways. There continues to be a need for determined action and a fight against these situations. 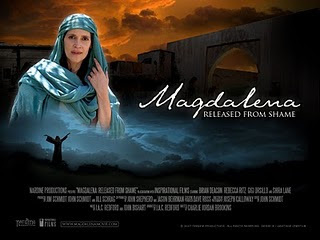 During the Magdalena film, Jesus relates on a equal level with all human beings, bringing complete acceptance and unconditional love in spite of being elderly, man, woman or child, Samaritan, prostitute, sick, sinner. The love of Jesus is practical. It´s not just theory. It´s not empty words. His love transformed situations in his society and met the needs of people. This is one of the messages that we try to convey during the film showings. In addition, we have invited all who attended the showing to participate in a women´s growth and study group that will start March 28th."